As the original perpetrator of all things chic and spiky, Christian Louboutin is definitely pushing the boundaries on how to refresh and renew their infamous studded shoes each season. For part 3 of my Christian Louboutin Fall Winter 2013 Mens shoes feature, let’s take a look at even more creative ‘spikes’ expressions for our favourite red soles. We have seen silver, gold, tone on tone,matte or shiny, big and small... when you think you have seen in all for spikes and studs, Christian Louboutin manages to surprise us yet again with how they can innovate. How about flocking the spikes and creating new velvety textures to make them even more luxurious? Yes, that is what the brand has done for their new Fall Winter 2013 Rollerboy Spikes Flat Plaid Floque. A tone on tone combination of grey flocked spikes against grey tartan makes this pair of Rollerboy wintery cool with a touch of Scottish appeal. Pushing the limits of the new flock spikes, the Dandy Pik Pik Flat Spikes Floque looked right at home on a Godzilla movie set as much as garnering camera flashes on a red carpet. Monstrosity or chic, you decide. Still not able to get your head around those flocked spikes, then stick to gold or silver tone ones against gorgeous velvety tartan in blue khol or red. However, the half pony and half spikes Tassilo Pony Black gets my full vote for understated elegance with a touch of rebel attitude. 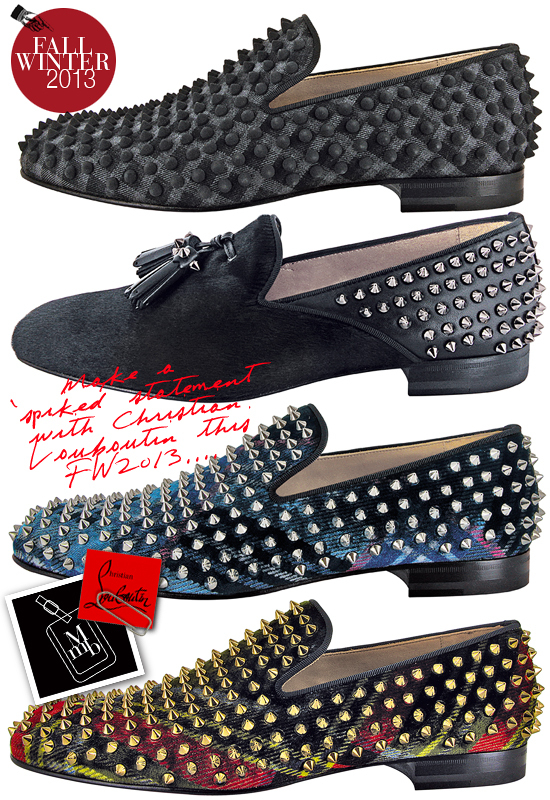 Click here for more pics of Christian Louboutin Fall Winter 2013 Mens Shoes (Part 3) on my facebook fanpage. 'LIKE' my fanpage if you enjoy reading this post.